Imagine you are on a cruise ship traveling through the most beautiful parts of the Danube river. 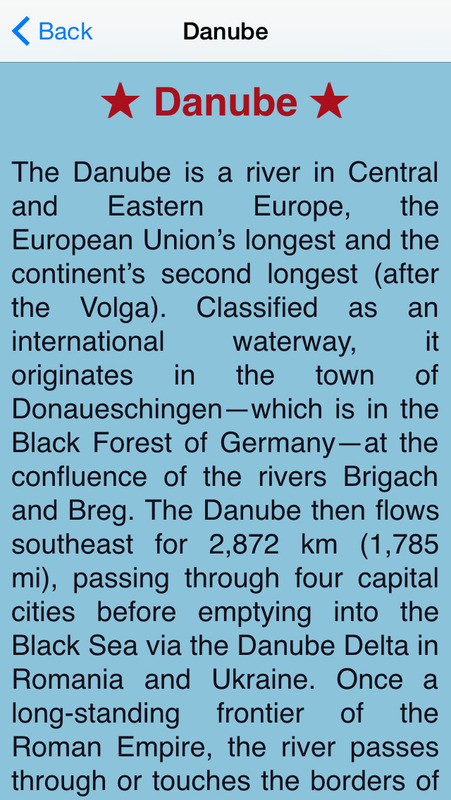 But what do you know about the second longest river in Europe? Well, this application is for you. Here you can find some information on the rivers of Europe and check your knowelege by quiz. Quiz and information on other rivers and seas will be added over time. The quiz exists in two modes - training and testing, so you can have fun with your friends. Enjoy the app and share it. The cruise season is about to start. We have added two photo quizzes. It is all about the Danube river and soon we will add more... It is a nice way to recall your cruise on this river, or discover what you could see. Please rate the app in the App Store!